There’s always SONshine; even on the rainiest day ever! This photo was taken at Okaloosa Island, FL. Jaiden had to have the cast put on her arm 3 days before we left for our vacation and it was a lifesaver! She never slowed down. She swam, built sand castles, jumped waves – did whatever she wanted. 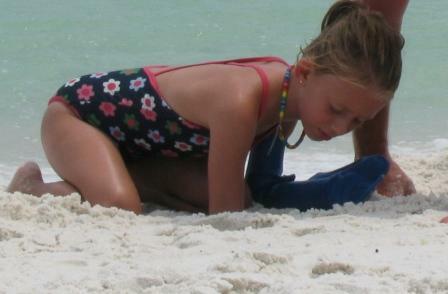 In this picture, Jaiden and her father are digging a hole in the sand to get to water so they can begin another sand castle!